Kleefeld on Comics: Iconography For Kirby's Unfinished Sagas? JACK KIRBY COLLECTOR #56 (84 tabloid-size pages, $10.95) focuses on “Unfinished Sagas” — series, stories, and arcs Jack never got to properly finish, and concepts that never got off the ground. From TRUE DIVORCE CASES and RAAM to KOBRA and DINGBATS, there’ll be gobs of unused art and text, including a complete story from SOUL LOVE! We’ll also present the rarely-seen 1946 Boy Explorers story “Trip to the Moon”, two Kirby Tribute Panels, plus MARK EVANIER and our other regular columnists, pencil art galleries, and more! So before I delve too deeply into things, I thought I might see if there were any requests out there. Are there any characters from Kirby's “Unfinished Sagas” that you would be interested in seeing analyzed from an iconographic perspective? I don't know enough to recommend anyone, though the cover in this post is certainly interesting. 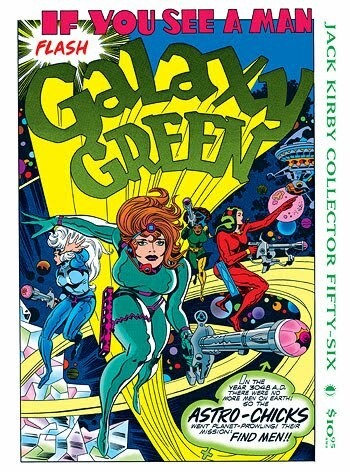 It would seem that, in a way, Kirby effectively created not only a comic book version of "2001: A Space Odyssey" but also a comic book version of a 1974 European film, which had rather a different character but which was released in English with an intentionally-similar title.